The way I see it, there are two kinds of people who have read the heading of this post. The ones who like fruit cake, and the ones who are about to stop reading now, because they hate fruit cake with the burning fire of a thousand angry suns. If you do happen to be of the second sort, I would like to tell you that I used to be one of you. I had the t-shirt, and paid my subscription fee on time, every time. Don’t worry though, I’m not going to knock on your door and shove cake in your face to try and convert you. But I am going to tell you what changed my mind – I started making them myself. I’d tried fruit cake in the past, either bought or made by someone else, and I just really couldn’t bring myself to like it. Then when my Dad was diagnosed with Coeliac disease and I had to start making a gluten free fruit cake at Christmas, I realised what goes into them, and which parts I didn’t like. And so I fixed them. That’s an easy fix, I know I don’t like it so I don’t put it in. But this one here is the big one: I cannot stand the taste of burnt fruit. You know that saying “raisin cookies that look like chocolate chip cookies are the reason I have trust issues”? That is me, times 1000. But only because the raisins can get overcooked, and don’t even taste like raisins any more. Burnt dried fruit stops tasting sweet and fruity and takes on a nasty, bitter taste. Fruit cakes take ages and ages to bake, and that’s why since the beginning of time (or whenever people started making fruit cakes, I’m not a baking historian but fruit cake has been around a long, long time) people have wrapped their cake tins in layers of brown paper and/or newspaper when baking their fruit cakes to protect the cake from the heat of the oven, and stop the outside of the cake from burning before the inside is cooked. I don’t know what the people whose fruit cakes I had tasted were doing, but whatever they were doing was not stopping the fruit from burning on the outside. Then I started making foil-and-paper-towel baking strips for my mud cakes, and realised I could use them for fruit cakes too. Ok, it made my Grandma look at me strangely when we were discussing wrapping tins for fruit cake, but all the Grandmas out there are just going to need to trust me. 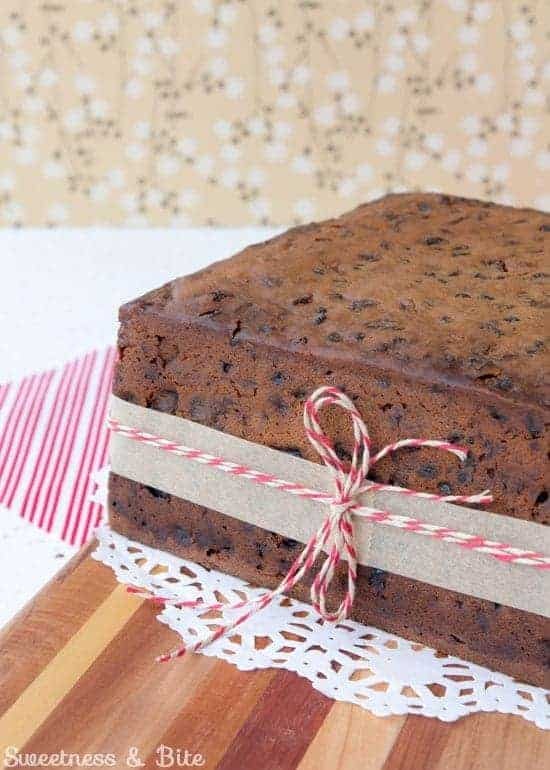 The baking strips work so much better for insulating the cake than the newspaper ever could, and better yet your house will smell only of delicious fruit cake, and not of burning paper. Or burning fruit! 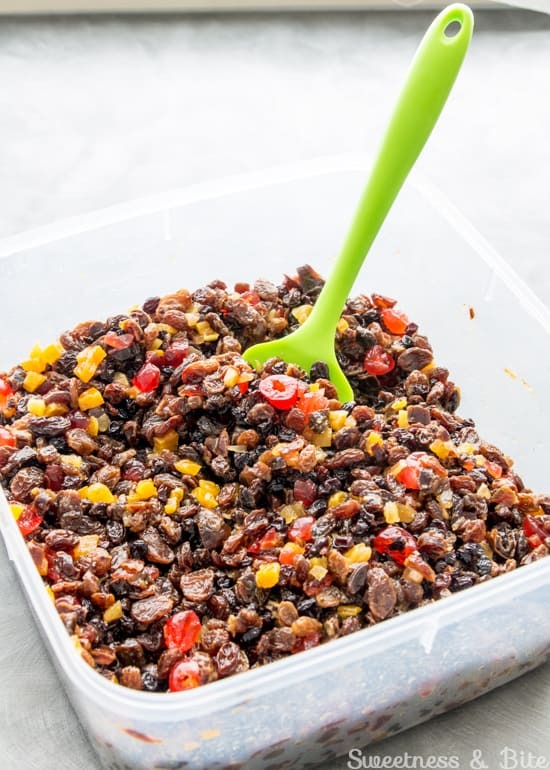 Making a fruit cake is a process, and this gluten free fruit cake is no different in that regard, but the steps are all pretty easy. First, you need to choose your fruit. Big tip – buy fruit that already looks nice and plump, and you’ll have a head-start on a super moist cake. You can simply buy a dried fruit mix from the supermarket, but since a lot of them contain mixed peel, I obviously avoid them. But if you find a mix you like, then buy it! It’ll save you a bit of time. By rights, I shouldn’t like these. I’m not a fan of anything that is kind-of-like-a-fruit-but-not-really. I don’t like fruit flavoured ‘things’ masquerading as fruit. Fresh cherries are my favourite fruit in the whole world, and while these maybe have started off as real cherries, they are nothing like real cherries. But I love glacé cherries. There, I said it. You’ve seen my shame. For me, half the enjoyment of making fruit cake is eating these while making it. In fact I often add extra just because I know that every time I stir the fruit mix, I’m going to pick out and eat a few more cherries. It’s a thing, for me. A Christmas thing. It makes me happy. But if you don’t like ‘em, by all means, leave them out. Remember, we’re only using the fruits we like. It’s a fruit cake revolution, people! So you just need to chop any larger fruits like apricots and dates into smaller pieces, about the same size as a raisin. Then rinse them under warm running water. This gets any sugary, dusty, cloudy stuff off them and also starts moistening and plumping the fruit up. Your fruit needs to be plump. Just sayin’. Then you can slosh over your alcohol of choice. I usually use brandy, but sometimes I use rum. You can use whatever tickles your fancy. And if you’re not keen on alcohol, then you can use orange juice. Just be aware that your cake won’t have quite the same keeping qualities as a boozy one. I like to mix the fruit and alcohol in a large airtight container. Once you close the lid the liquid can’t evaporate – it has no choice but to be absorbed by the fruit. Plus it means that in between stirs, I can just shake the container to mix it all up. (Saves a few cherries from being eaten, just quietly.) It needs to be left at least overnight, (a few days is even better) for the fruit to soak up all of the alcohol. Once your fruit has sat and done its thing, you can mix up the batter. If the mixture curdles after adding the eggs, don’t panic, it will come back together once the flour is added. You can beat the crap out of it anyway, we don’t have to worry about overworking the gluten! Gluten free baking has its advantages. And even if you wanted to make it with wheat flour (it works equally as well), a little gluten overworking in a fruit cake is really no big deal. Some people even use extra gluten-y bread flour in their fruit cakes, to help it all hold together. We’re using Xanthan gum in the gluten free version of this cake to replace the gluten. The gum helps to bind the mixture together, and to stop it from crumbling when you cut it. You can leave the gum out of the recipe if you prefer, just be aware that the cake slices won’t hold together quite as well. Maturing a gluten free fruit cake (I’ll talk about that more below) will also help it to cut neatly. 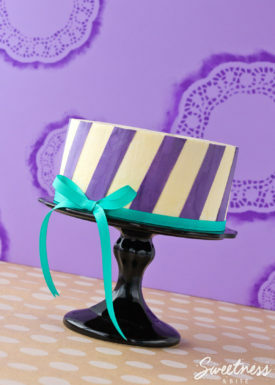 If you’re planning to turn your cake upside down to decorate it with fondant, then here’s a tip for making the bottom nice and smooth (sorry, it doesn’t work on cellulite). After mixing up the batter and before adding the fruit, take a couple of spoonfuls of the batter and spread it gently into the bottom of the tin. You can do the sides too, if you like. Just make sure you’re careful not to scrunch the baking paper with the spatula. Then pop the tin into the fridge while you’re adding the fruit to the remaining batter. Some of the fruit may sink down through the batter, but generally, you will get far fewer holes caused by the fruit that will need to be filled (with marzipan or almond icing, or fondant) before covering in fondant. Then you can add in the rest of your drunken fruit to the batter. 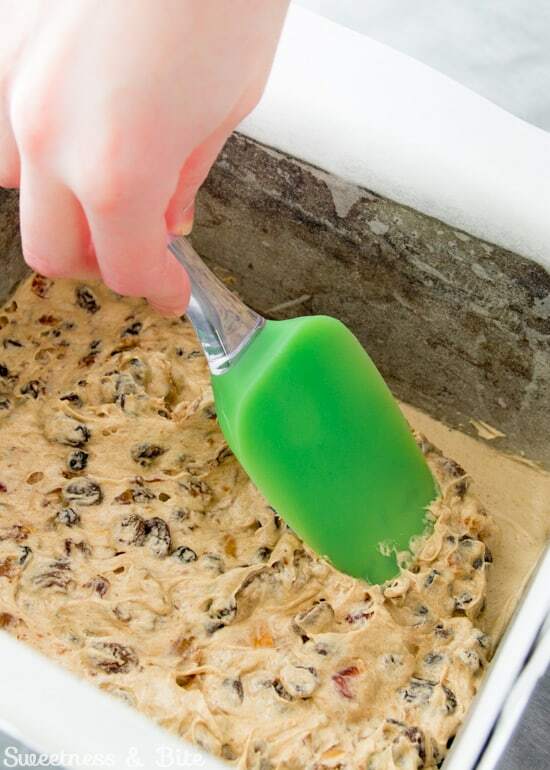 If your mixer bowl is too small, you should transfer the batter to a larger bowl or saucepan. I use our giant pasta pot. When doing an extra large batch for multiple cakes, I’ve been known to use my Mum’s enormous preserving pan. Now you can cram it all into your prepared cake pan. The batter lining should have firmed up in the fridge, and shouldn’t move too much as you add the rest of the batter. I like to add a few spoonfuls at a time and press it in with a spatula to make sure there aren’t any gaps. You can fill the tin up almost to the top, the cake has no raising agents, so it won’t rise much at all. I’m not gonna lie to you, this cake takes some baking. Because it’s being baked at such a low temperature, it will take a good few hours to bake through. This low, slow baking will ensure the outside doesn’t burn before the centre cooks through. Then, once it comes out of the oven you can brush the cake with more brandy. 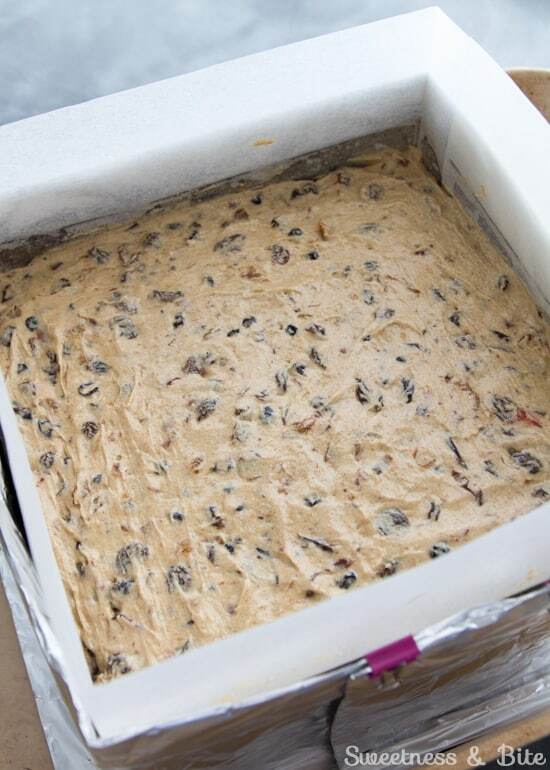 Fruit cake is traditionally made months in advance of when it is supposed to be eaten. “Maturing” the cake improves both the flavour and the ability to cut it into neat portions. While the cake matures you can ‘feed’ it more alcohol, which keeps the cake moist. It also means you can store it for a long time without it going mouldy. I’ve often seen recipes for gluten free fruit cake that say the cake should be made close to serving. I’m not sure why those particular ones say that, but this one here can be matured for just as long as an ordinary fruit cake. In fact, it benefits even more as it helps to stop the cake crumbling, which can sometimes happen with gluten free cakes (and especially gluten free fruit cakes) depending on the flour you use. Having said all that, if you find yourself close to Christmas and you haven’t baked your cake yet, don’t despair! This cake is still pretty darn good even when made at the last minute. Some years I’m very disorganised and forget to bake our cake until the last minute. In fact, the one pictured here was made a couple of weeks before Christmas, and we had no complaints. Make sure you check out my post on lining cake pans and making baking strips, and for gluten free baking tips, check out this post too. Yield: One 8 inch square (4 - 4.5 inch tall) cake. 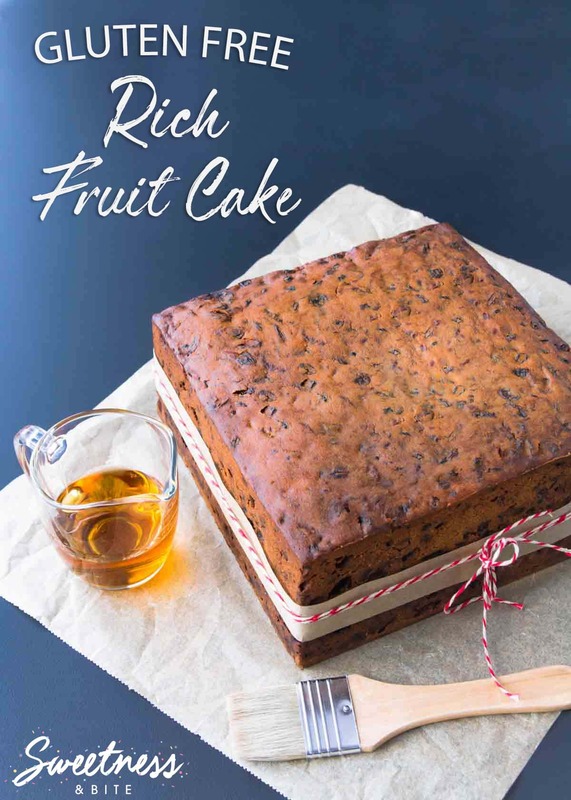 A rich, moist gluten free fruit cake, laced with brandy ~ the perfect gluten free Christmas cake or traditional wedding cake. 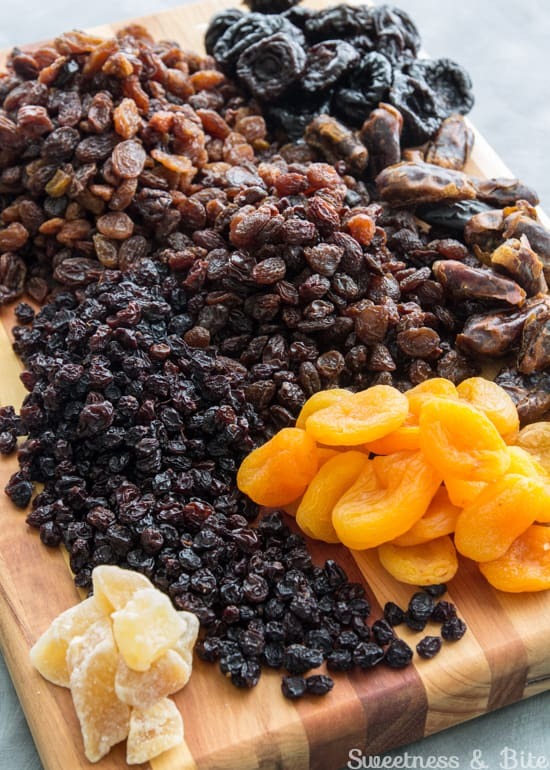 Cut any bigger dried fruit (like dates, apricots, prunes, etc.) into smaller pieces, about the same size as a raisin. 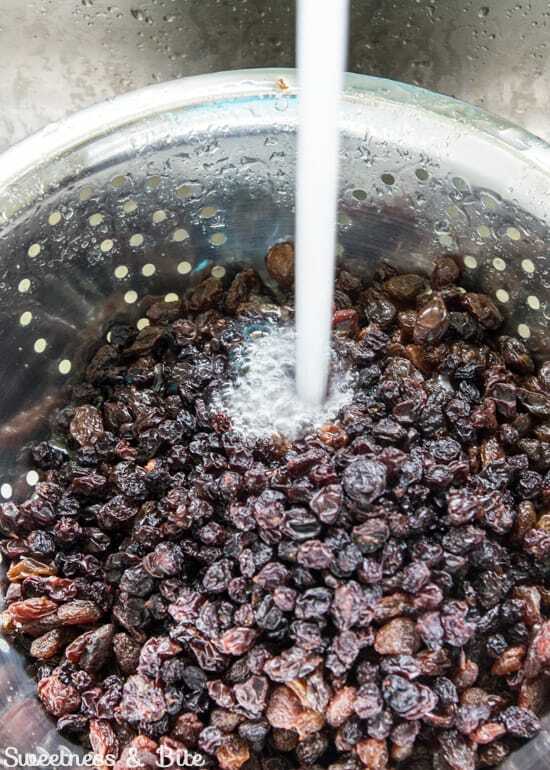 Place the fruit and glacé cherries (if using) into a colander and rinse it under warm running water. You may need to do this in batches (I do each fruit separately as I weigh and cut it) Drain and place into a large bowl or plastic container. Add the glacé ginger, citrus zest and brandy. Stir well, cover and leave overnight (stir or shake it occasionally, if you remember). Preheat the oven to 150 degrees Celsius. 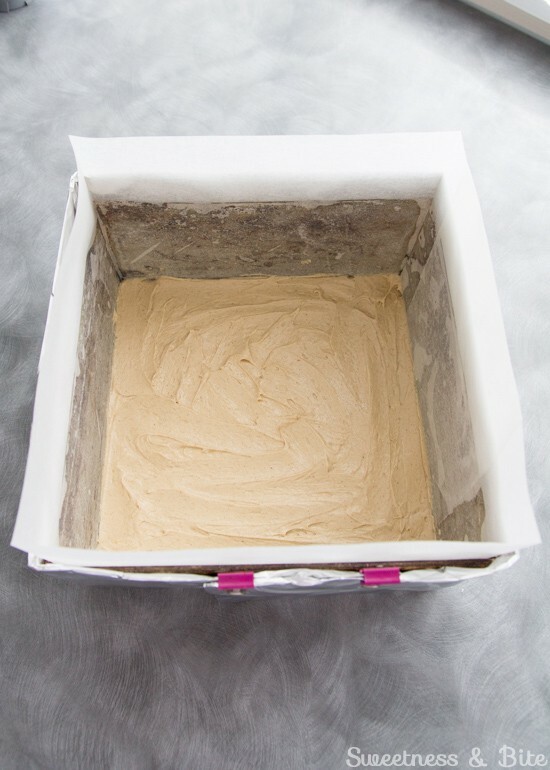 Line an 8” square cake pan with baking paper, and wrap it with baking strips. Make a foil lid. See this post for details. Sift the flour, xanthan gum and spices into a large bowl, and whisk to combine. 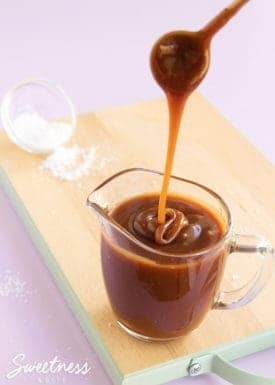 Place the butter, sugar, vanilla and golden syrup into the bowl of a stand mixer fitted with the paddle attachment (or use a hand mixer and a large bowl). Beat until fluffy, scraping down the bowl a couple of times. Lightly beat the eggs together in a small jug, then add gradually to the butter mixture, beating well in between additions. Don’t worry if it starts to curdle. With the mixer on low speed, slowly begin adding the flour mixture a few spoonfuls at a time. Once all of the flour is added, scrape down the bowl and mix again. To make the bottom of the cake smoother (if you’ll be decorating the cake with the bottom as the top) then take out a few spoonfuls of batter and spread it over the bottom of the cake pan. Pop the pan into the fridge while you mix the fruit into the remaining batter. If your mixer bowl isn’t big enough to fit the fruit in as well, transfer the batter to a larger bowl or saucepan. Add the fruit (and any remaining brandy that hasn’t been absorbed by the fruit) and mix well until evenly distributed into the batter. Place a few large spoonfuls into the cake pan, and use a spatula or spoon to press it into the pan, especially the corners. Repeat until the pan is full. Wet your hands or a spatula and smooth the top. Bake the cake for 4 - 4.5 hours, or until a skewer inserted into the middle of the cake comes out mostly clean. To double check, once the skewer comes out clean insert a thin bladed knife into the cake and check that it comes out clean or with only a few crumbs attached. Leave to cool for 30 minutes, then brush or spoon over some more brandy. Fold down the baking paper, then cover the whole cake pan with foil and leave overnight to cool. 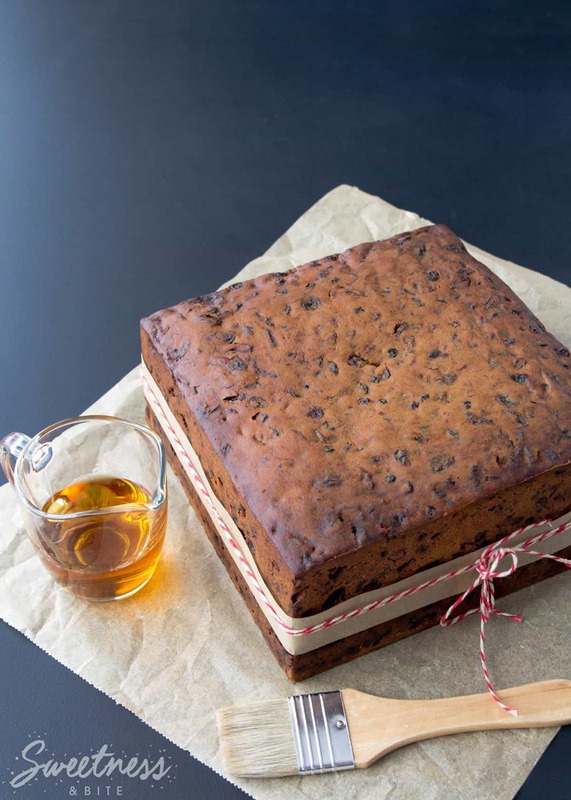 To store and mature the fruit cake, turn the cake out onto baking paper, brush all sides with more brandy, then wrap well in the baking paper, and store in an airtight container. To further flatten the top of the cake, store it upside down. The weight of the cake will help it to flatten. You can continue to brush more alcohol onto the cake at regular intervals until the cake is served. 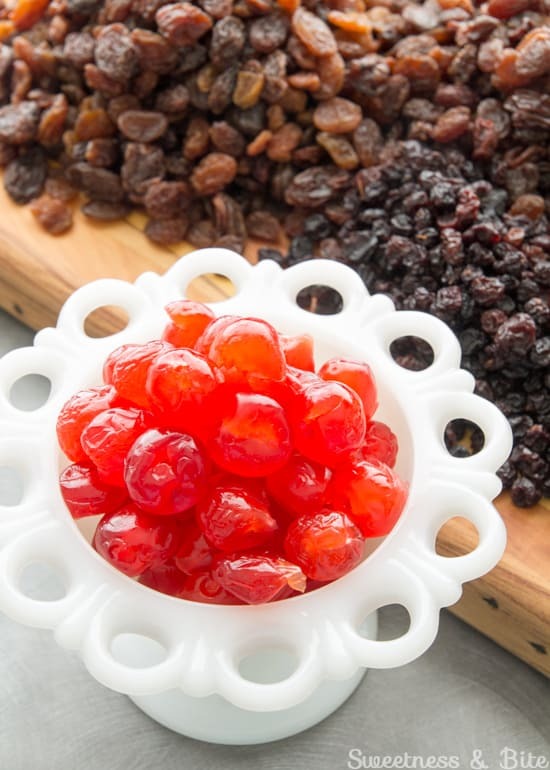 *You can use a packaged dried fruit mixture or choose individual dried fruits to make up the 1.5kg of fruit. I used 500g sultanas (golden raisins), 300g raisins, 200g currants, 200g dates, 200g prunes and 100g dried apricots. Dried cranberries, apples, pears or figs are also great additions. 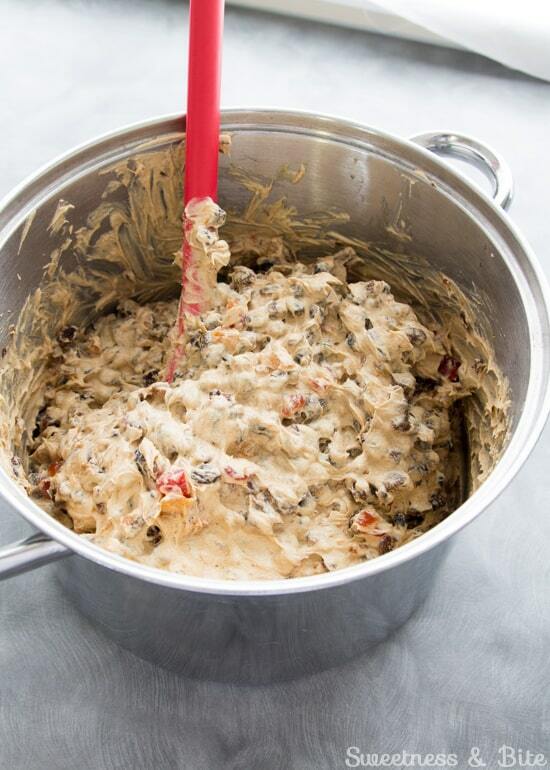 If you like nuts in your fruit cake, you can also add in a handful or two of almonds or your favourite nuts, you don't need to leave out or adjust anything else, just chop them up and add them to the batter when you add the fruit. **The gluten free flours I used in this cake are: 200g tapioca flour, 200g brown rice flour and 100g potato flour. If using a prepared flour blend that contains xanthan or guar gum, omit the xanthan gum from the recipe. If you find that with the gluten free flours you've used the cake is crumbly, don't despair! Warm it up and serve it with custard like a christmas pudding, or mix it with dark chocolate ganache or almond flavoured buttercream to make cake balls. This recipe works equally as well with regular all purpose or high grade (bread) wheat flour if you don't need it to be gluten free. Ideally this cake should be made 2 - 3 months before you want to serve it, but it still tastes fantastic even if only matured for a week or two. I’ve been baking gluten free for years and am always looking for great recipes to try. This recipe is better than great! The cake is divine and will now be given to gluten free friends as Christamas Cake – it’s that good! Thanks so much for sharing it. I have certainly over indulged in it as it’s delicious. Hi Vicki. You’re so welcome, and I’m glad you love this cake as much as I do! I’ve been known to overindulge in it too, in fact I generally have it for breakfast after Christmas (and in fact, any time of year in which I make it). Because, you know, it has fruit in it, so it’s clearly a sensible breakfast food ? Hi Karen, it really depends on the size of cake you need and how many people you need to feed. This recipe is suitable for a 9″ round cake pan, for other cake sizes you can input the ingredients into a calculator like the CakeOmeter and it will tell you how much you need for different cake pan sizes. Hope that helps. I made this cake last Christmas as my daughter-in-law had had to move to g-free foods. We were all a bit dubious about replacing a really excellent tried and tested traditional cake with a g-free one but our fears were groundless. The cake was delicious, moist and not crumbly when sliced. I put this down to the long soaking of the fruit which I left for about a week (mainly because I just found I didn’t have time to get on with the baking before then !). Now I just have to look up how to make a smaller one for a member of the family. I’d thoroughly recommend this cake. Should the recipe have any baking powder in? Going to try it as it looks yummy but I’d expected BP. Fab thanks. Makes perfect sense. The fruit is soaking right now in Balvenie sherry cask whisky… mmmmm. Well I just finished marzipaning a gluten free version (with Brandy as it is gluten free) and a non gluten free version (with Whisky) and I can honestly say the cut offs from both were absolutely scrumptious. This is a keeper. Did you follow your recipe exactly and just replace gluten free flour? Did you add xanthan gum in it? I m also looking for some mince tart recipes. God I can relate about the peel, will definitely leave peel out when trying to make this at Christmas…. And glace cherries, yuck! Nice post. Just an FYI Brandy has gluten so you might want to make note of that. Maybe you did and I missed it. Hi Heidi. As far as I’m aware brandy does not contain gluten. 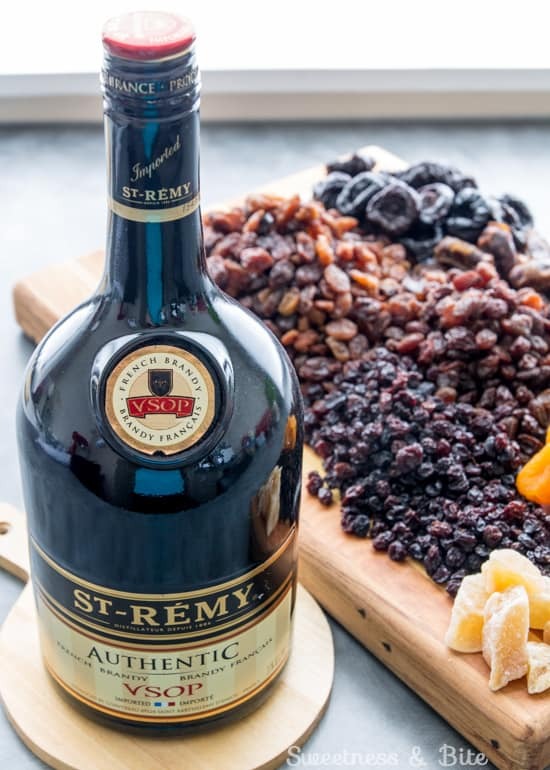 Some specialty flavoured brandies can be flavoured with malt, but regular brandy is made from fruit and does not contain gluten-containing ingredients. Coeliac.org.nz “What Alcohol is Gluten Free? One of your ingredients is ‘1 Tsp of mixed spice’ can you clarify what that is? Like a pumpkin pie spice? Thanks! I made mini loaves and baked them for 1 hour… they smell amazing and I can’t wait to taste them! thanks for the great recipe! I recently found out that nutmeg has sharp edges, so if you are looking after your intestinal tract, (gluten sensitive etc), maybe choose other items. Hope this helps. What is the golden syrup that you use? Looking forward to trying this since my husband loves fruitcake and have not had much success since going guten free. Thanks for sharing! I’m sitting waiting for the current incarnation of this cake to finish. Love the aroma. I make it with Nuttelex as I’m also dairy free. I’ve made 2 Christmas versions and my 40th birthday cake last year. This one is for Dad’s 70th next month. Unless told, no one knows it’s an allergy friendly cake which is always a good sign. In fact, it’s one of my favourite fruitcake recipes yet and I’m the designated fruitcake cook in the family. I’ve found Spiced Rum to add a nice kick as an alternative to brandy (it’s what was on hand), the current version has tawny port. Thanks for the recipe. Hey Sally 🙂 Ooooh, the spiced rum sounds amazing!! I’m really glad you love the recipe as much as I do. And now I’m going to have to keep an eye out for spiced rum! I need a gluten, dairy and nut free fruit cake to use for a wedding cake. I’m really interested to try this recipe. My son wants to keep the top tier for the first baby as tradition dictates. 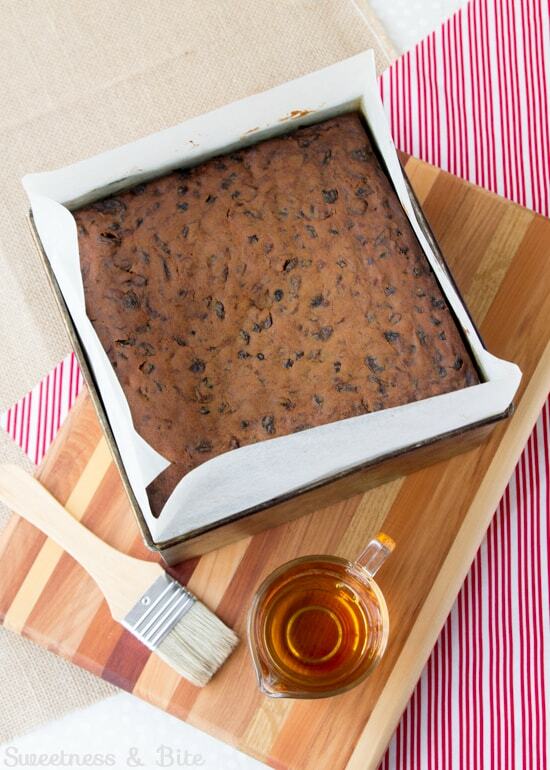 Do you know if this cake will keep for a long time like standard fruit cake? Hi Pat. This cake does definitely keep well, but I haven’t actually personally tried keeping it for longer than about three months (it never lasts longer than that in our house, someone always gives in and cuts it!). Theoretically it will last as long as any other fruit cake, the alcohol (especially when it has been ‘fed’ with more alcohol for a few weeks before being decorated) and the high sugar content in the fruit preserves it, but I would hate to tell you that it will definitely last and then have it not. What I would suggest doing (if this wasn’t already your plan) to keep it is to freeze it after the wedding, ideally removing the icing first, wrapped well in plastic wrap and placed in an airtight container. You can freeze it with the icing on, but you can have issues with condensation as the cake thaws which won’t do the icing any favours. 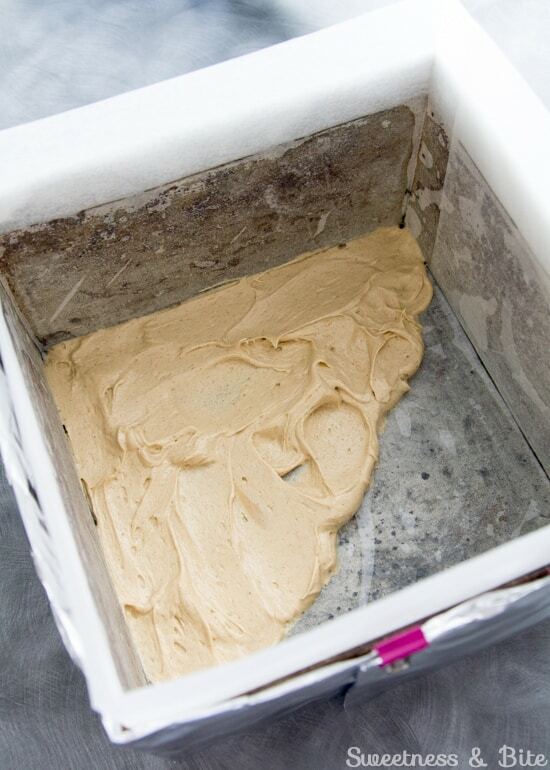 It’s best to let it thaw still fully wrapped and in the container until completely thawed, that way the condensation will form on the outside of the container and not on the cake. Alternatively if you have a tried-and-true recipe you would normally use that keeps well, I’d be happy to make suggestions on how you can make it gluten and dairy free. I usually use Delias traditional Christmas cake recipe and it would be wonderful if the “free from tiers “appeared to be the same … I can Diferentiate by not using marzipan on that tier. That’s probably a good idea (and you can’t really go wrong with Delia!) 😉 Ok, so what I do when I’m converting recipes is take the flour amount (by weight, not by cup measurement) and use 50% tapioca starch, 40% brown rice flour and 10% potato starch to make up that amount. Then add about a teaspoon of Xanthan gum (for an 8″ cake recipe, if the cake is bigger you’ll need to add a bit more). That’s basically the combination of flours I use for all my cakes these days, and I get really good results with it. If you want to use a purchased gluten free flour blend then use it as a weight-for-weight substitute, if it has a gum ingredient (usually Xanthan or Guar Gum, but sometimes it’s CMC, also known as E466) then you don’t need to add any Xanthan gum. The gums are there to help bind the ingredients together in the absence of gluten. I still find I get much better results from mixing my own flours though, a lot of the packaged blends are very high in starch and tend to make for a crumbly cake. Rather late to the party, and probably too late for the wedding in question, but just a note for Pat or anyone planning to do “free from” tiers: they’re fine for people who have non-coeliac gluten sensitivity, but coeliacs can’t eat gluten-free cake that’s touched gluten-containing cake: even one tiny crumb that’s crossed from the main cake to the “free from” cake can make them sick. If you have the tiers physically separate, and make sure to keep them separate, and have separate servers, it’ll be OK – but if you really want to be kind, tell the coeliac what you’ve done, without asking (they hate having to be “that person” who asks all the time). 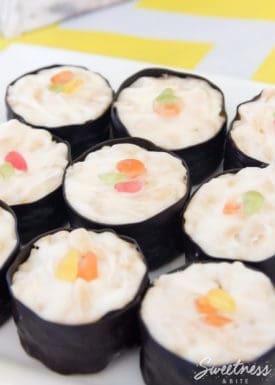 I am going to make this in the next few weeks, but I have a couple of questions. 2) If I were to make this non-alcoholic, would I soak the fruit for a week in juice, and then baste the cake afterwards with more juice? I’m making this for a diabetic. 3) Is the cake pretty moist to begin with? I made a fruitcake last year that was gluten free and alcohol free and it was kind of dry. Thanks so much! This looks delicious! If you’re not using alcohol then I would prepare the fruit as per the recipe and leave it in the fridge overnight rather than on the bench, as fruit juice can sometimes go a bit funny if it’s left at room temperature for too long. Then just take the fruit out of the fridge an hour or so before you want to bake the cake so it can warm up a bit. You can feed the cake with orange juice when it comes out of the oven, but I wouldn’t add more to it during the maturing process. And I would suggest only doing it a week, maybe two at the most before you want to eat it. The alcohol helps to preserve the cake, so making it with juice will reduce the keeping qualities. It’s probably best to mature it in the fridge, that’ll help it keep a bit longer. Just wrap it up really well, pop it in an airtight container in the fridge. I can’t guarantee how long it will last though, as I haven’t done it that way before. Yes it’s definitely a moist cake, I hate dry fruit cakes, so I wouldn’t be able to eat this one if it was dry 😉 And I don’t think it’s only the alcohol that makes it moist, as a couple of times I’ve made the cake, put it away to mature and kinda forgotten about it so I didn’t feed it with any more alcohol, and it was still nice and moist. I just finished wrapping these in foil to cool overnight.I had to try a bite as the smell in the house drove me insane (in a good way). This is AMAZING! 1) I used molasses instead of golden syrup and it’s delicious. 3) I did not use alcohol. Instead I used the zest and juice of 1 lemon and 1 mandarin orange, as well as a citrus juice blend. I basted the loaves with the juice after they cooled 30 min. The smell and taste is out of this world! 4) This made 2-6″ Wilton round cake pans, as well as a a 9″ long loaf pan. 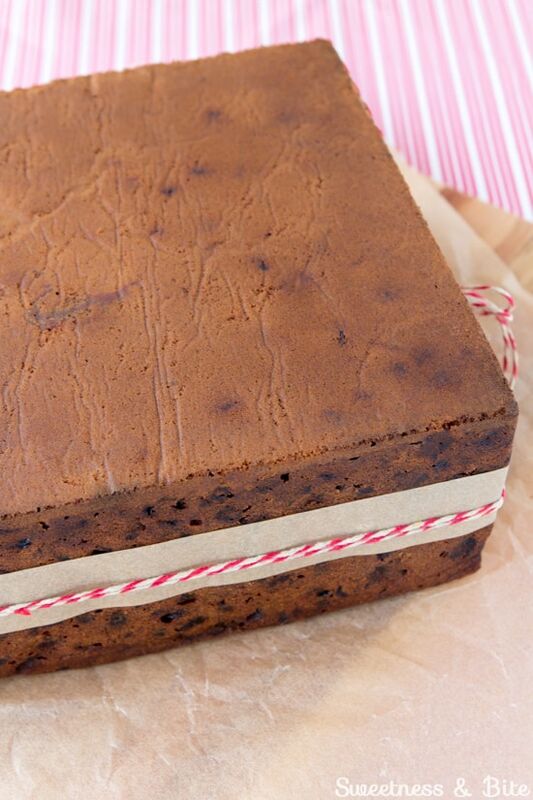 5) I used the baking strips idea and I think it makes everything so moist as fruitcake can be pretty dry. I will freeze the remaining loaves as they won’t “preserve” sans alcohol. 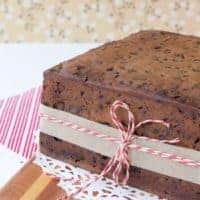 This is the best fruitcake recipe I have ever made or eaten. Thank you Natalie for sharing this. You truly are an amazing baker! Could I substitute almond flour instead of GF Flour? loving the sound of this cake which i will try next week once brought all the fruit especially cherries. My question is I need to also do dairy free can I use Margarine- Oliviani . Nice been able to find a GF xmas cake that people enjoy dont last long in our house thats for sure. I am making this again for 2017. It was a hit last year so I’m coming back to it. I don’t want to use golden syrup so I replaced it with maple syrup. I also soaked my fruit in a large gallon glass jar for 2 weeks, in Cuban rum and just kept rolling the jar around once a day to keep the fruit mixed up. I do love citrus peel however, but I made my own. I candied lemon and oranges cut into strips and chunks, in local multifloral honey and chopped them up fine and added them to the fruit mix. 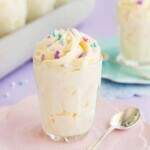 I tasted the batter and wow it was out of this world delicious! It is baking now, and I used 8 – 5 inch mini loaf pans, set into a large roaster with about 1/2 inch of water in the bottom so these thin foil loaf pans don’t scorch. Well here’s hoping! I’m no expert but I wanted mini loaves to share with people. I also covered the large roaster holding all the mini loaf pans with foil to keep it moist, and I’m praying, from burning. I see from my last comment in 2016 that I did mini loaves, but they were smaller then these and I baked them for an hour. I will test these in an hour and then probably remove the foil from the pan and maybe let it go for another 1/2 hour or so. I took pics but don’t see how I can share them to show you.. Instagram maybe? I will let you know how they turn out! Fingers crossed! Thanks again for such a great recipe! Happy holidays in 2017! I will put the pics online, because wow they sure look delicious! I ended up baking them for 2.5 hours, till the cake tester came out clean. They were cooked in a more moist environment with the water in the pan and being covered for most of the cooking time. I was worried about the mini loaf size getting dried out if I cooked them in an open oven, and the method you described to shield a large cake pan wouldn’t work with 8 foil mini loaf pans. I uncovered them for the last 30 mins. I have them brushed with Cuban rum and wrapped up to age so I can’t report on the texture yet, but a small taste was out of this world amazing. I appreciated your gluten free flour mix weights, as this was very helpful to get the flours right. The key to getting a nice mixed peel is to use the best quality organic fruit you can find, and chopping them up really fine, because you don’t want big chunks in your cake. I used the whole fruit, and slowly simmered it in honey until all the juice had evaporated and turned thick and sticky with intense flavor. 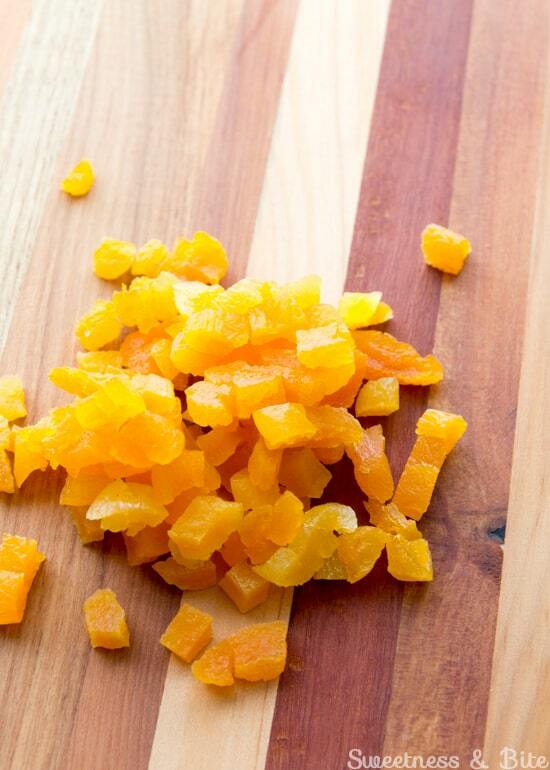 There are recipes online that explain this process of how to candy citrus peel. You can use sugar and water if you can’t or don’t want to use the honey. Hi Natalie, I am looking forward to trying this delicious recipe but have one question before I start. Do I need potato FLOUR or potato STARCH for the flour mix? Thanks. Hi Dannielle, if you’re making it with normal flour then nope, you don’t need the gum 🙂 In an 8″ tin the cake is about 4″ high, so if you’re cutting it into 4 then they’d basically be 4×4″ cubes. If you did it in a 10″ tin then I would guess they’d be about 3″ high, maybe? I made this in a 10 inch tin then cut into quarters, it was a perfect height for the smaller cakes. Cooked in about 2.5 hours. 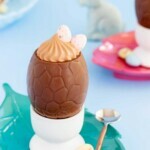 And so easy to decorate with the perfectly flat tops! Will definitely be making this every year, thank you. Hi Linda, I can’t see why it wouldn’t work, although I don’t know how much of the brandy that kind of fruit would absorb during the soaking process, so maybe reduce the amount of brandy and see how it goes. If it does absorb it then you could add more. I have this fruit cake in the oven now. Just wondered if the foil lid stays on for the entire cooking time? Can I just skip the brandy in this recipe? I figure it adds to the flavour, but does it add to the texture? Should I add a bit more water to make up for any moisture? I really don’t want to add brandy. I live in Canada where all alcohol is extremely expensive. I would like to make this for a couple of gluten free relatives but I am not as fussy as some people. No baking strips, no lined pan, etc. Can I just use my 9 x 5 loaf pans for this? Also, I noticed that in one picture there are figs, dates, raisins, apricots and then cherries. Some of these are not on the list of ingredients. Are the part of th mixed fruit? I love the glace cherries by the way. I will also include black currants (not easy to find), cranberries, zest and dried apples as well as golden raisins, figs, and dates. Is it possible to use lupin flour instead of the other gf mix? Is xanthan gum absolutely necessary or can I leave it out. 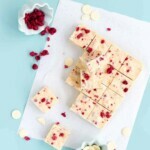 Hi Natalie – thanks for this recipe! Trying it today with but using half the recipe to make a smaller cake – any tips on cooking time? I am assuming 2.5 hours would be right? I am using Drambuie as my alcohol 🙂 I eat gluten free but as am not celiac I am happy to risk a bit of gluten in the boozy element. I will add raw almond to the top too. Hi, I hope I’m not repeating a question here…. how much alcohol and how often in the maturing section? I didn’t have an 8 inch square tin so i used a 9 inch round. The cake grew so much in the oven!! It over flowed the 3 inch high sides. Luckly my lining paper went up over 4 inches and I had made the strips 5 inches. Hi Kay! There is no hard and fast rule as to how much alcohol to use when maturing the cake, nor how often to brush it, it’s really up to you. I tend to just use as much alcohol as the cake will absorb, you don’t want it making a big puddle on the wrapping. So I just brush each side until it stops soaking it up. Probably somewhere between a quarter to half a cup. I just pour some into a glass and brush it from that. Start with less and add more to the cup if you need more, so you don’t waste it if you have too much (unless you want to drink it, up to you!) 😉 If you poke holes in the cake with a skewer then it will absorb more, but I don’t usually do that. As for how often, usually I just say “as often as you remember to do it!”. Sometimes I only remember to do it a couple of times, but you could do it once a week or once a fortnight, depending on how early you make it. So if you’ve just baked it, you could get in at least a couple of “feeds” before Christmas. 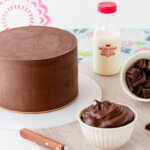 How long can I store my cake in the fridge? Hi Sophia. Oh no, that’s pretty heartbreaking! It’s hard to tell without seeing the recipe, but I can try and take a couple of guesses at what the problem could be. Does the recipe use cup measurements or weights? I find that recipes with weight measurements convert far more successfully than those with cups – gluten-free flours don’t tend to be the same in density as wheat flour, and in general cup measurements are quite inaccurate. That tends to make even more of a difference in gluten-free baking than regular baking, so if you can use a recipe with weight measurements then they’re usually more successful. If there turned out to be not quite enough flour in the cake, that could explain the grease leaking out, as it wasn’t absorbed by the flour. It does sound like a lot of eggs, too, depending on what size cake it’s supposed to make it could be more eggs than necessary. I was working on a mud cake recipe that kept turning out rubbery until I reduced the eggs, then it was perfect. So you could try reducing the eggs. Also sometimes gluten-free flour mixes use too much of a gum ingredient in their blend – but while I’m not familiar with dove’s farm flour myself (as it’s not sold here in New Zealand) I do know that some of my readers use it successfully in my recipes, so unless it was a bad batch I don’t think it would be as likely to be that. You could try it with a different flour though, just to see. I hope that helps somewhat. Bets of luck! 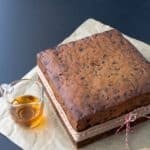 This is a great tasting fruit cake, I made my first one this Christmas as I have just gone on to a Gluten Free diet and I really like dried fruit. I tried a half measure first cake as my family are not into fruit cake as I am as fruit cake was my mothers standard 70 years ago and I was brought up on them. It is quite a heavy/solid cake and I was wondering if I reduced the amount of fruit and increased the flour and added extra baking powder I could create a lighter cake for every day use? What amounts would you suggest I try, as you may guess I am not a Baker by background. Thanks again for a great receipt. How tall was the original cake/tin? I need this info to convert the size for a wedding cake. Would the cake definitely be dry without strips? Hi Maddy, the cake tin I use is a 4″ high 8″ square pan. The cake generally comes to the top of the pan, sometimes a bit higher. But it tends not to rise very much. For future reference, I always pop the size and height of all my cakes at the top of the recipe card, to make it easier for people to convert 🙂 The cake won’t necessarily be dry without the strips, as long as you are brushing it with alcohol when it comes out of the oven which helps to keep it moist, but the strips do help a lot to prevent the edges of the cake from burning before the cake is cooked right through to the middle. I would love to try your cake recipe to make my wedding cake, unfortunately I’ve been newly diagnosed as intolerant of dairy products & eggs. 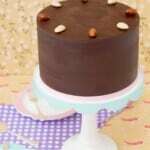 Have you ever tried making this cake using dairy free and egg alternatives and if so can you give me the amounts please. Hi Diane. I’m afraid I haven’t made this cake without dairy or eggs, but I think it would be worth giving it a go. I’d suggest using dairy-free margarine that says it can be used for baking (they’ll usually say so on the packaging) and use the same weight of the margarine as you would butter. You’ll probably need to use an egg “replacer” like Orgran (or equivalent product where you live) and follow the instructions on the package for the amount to use to replace each egg. The replacer will help to bind the cake together, otherwise it will be very crumbly. I’d definitely suggest doing a small half-batch trial cake beforehand to see how it goes so you can tweak it if you need to.